Hanka Otte is te winner of the fourth Boekman Dissertation Prize. 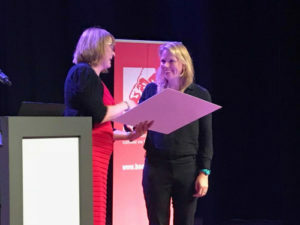 Hanka Otte was awarded the Boekman Dissertation Prize in an award ceremony on 30 October. The Boekman Dissertation Prize is awarded once every three years to the best Dutch dissertation in the field arts, culture, and society. Dr. J.F. (Hanka) Otte graduated from the University of Groningen in 2015, with a dissertation titled Binden of overbruggen? Over de relatie tussen kunst, cultuurbeleid en sociale cohesie (Binding or bridging? On the relationship between art, cultural policy, and social cohesion). Cultural activities, particularly of amateur art and community art, are assumed to connect people. This expected social effect is one of the legitimacy grounds for governments to promote participation in the arts. How do participation in art and social cohesion relate to each other? With participation in the arts, does the government choose the right instrument to promote social cohesion? This study into the cultural participation policy 2009-2012 in the Netherlands and the province of Drenthe tries to find an answer to these questions. Hanka Otte argues that art as a form of play has a distinctive effect on the attitude of people towards foreign others. Even so, cultural projects do not innately have a connecting effect. However, if certain conditions are met, art that challenges perception can lead to a bridging attitude, while affirmative art sooner seems to bind, because existing relationships are strengthened. 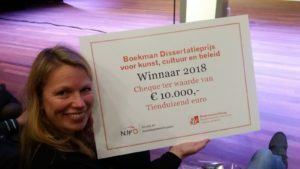 Together with the NWO (Netherlands Organisation for Scientific Research) Department of Human Sciences, the Boekman Foundation initiated the Boekman Dissertation Prize in the field of arts, culture and related policies. Both organizations hope to stimulate the public attention for scientific research in the expectation that this will give a positive impulse to the quality of making art policies. The Prize is named after the Amsterdam Alderman for Education and Cultural Affairs Emanuel Boekman (1889-1940) as he was the first to obtain a PhD on art policy in the Netherlands. A jury consisting of René Boomkens (University of Amsterdam), Quirijn van den Hoogen (University of Groningen), Philomeen Lelieveldt (Utrecht University), Vivian van Saaze (Maastricht University), and Kitty Zijlmans (Leiden University and president of the jury) chose Otte’s dissertation from among 74 eligible submissions. The other nominees were Jos van Beurden (Treasures in trusted hands: negotiating the future of colonial cultural objects, VU Amsterdam, 2016), and Theisje van Dorsten (Mirrors in the making: culture eduction, and the development of metacognition in early and middle childhood [4-10], RUG, 2015). The jury report is available from the website of the Boekman Foundation.